5 Things To in New York when it’s cold. Don’t let the weather put you down! There are tons of activities to do in New York even when wind, rain and snow threaten to wreck the day, not for nothing has it earned the title of the city that never sleeps. While you can always stay at home for binge watching or relax in a spa, there are more thrilling ways to avoid freezing and have a great time. Whether you want to spend some time in the outside challenging the cold breeze or you are more kind of an indoors-person, there are plenty of options to choose from so put your jacket on and enjoy. One of the most exciting things to do in winter has to be Ice-Skating and in NYC there are the best places that can assure an unforgettable experience. 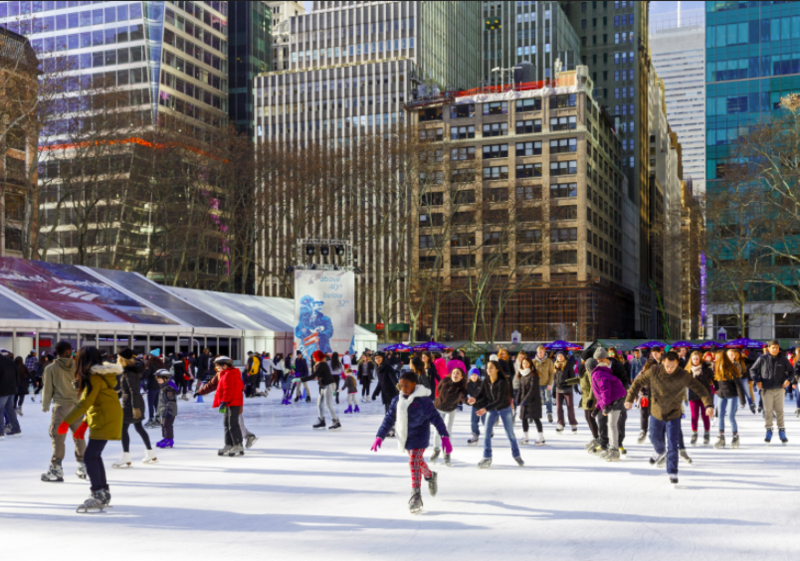 In the Winter Village at Bryant Park you can enter the rink for free! If you have your own skates there’s no excuse, either way you can rent them for $20. Though it’s very crowded, another excellent place and the most famous one is The Rink at Rockefeller Center, where you can take a spin below the Prometheus statue. Now, if there’s a place that can make you feel in a winter tale, that’s the Wollman Rink in Central Park, where you observe a landscape full of snow-covered trees surrounded by NYC skyscrapers. There are even covered ice rinks for the people escaping the weather like the Aviator Sports and Event Center Rink, Lakeside and the City Ice Pavilion. Museums can be the best choice to have a relaxed day dry and warm and there are hundreds of exhibits, you can spend your time wandering around and learning from history, science, art and design. Some are always free, others have specific days or hours with free admission and there are a few with discounted admission. We can recommend the American Folk Art Museum and the Bronx Museum of the Arts, which are free, but you definitely have to visit the American Museum of Natural History and the Metropolitan Museum of Art, institutions where you can enter with a suggested donation or whatever you can afford. You can find other interesting exhibitions at the Guggenheim Museum, the Lower East Side Tenement Side, the Museum of Modern Art, the Museum of the Moving Image and the Whitney Museum of American Art. Voted in 2015 as the #1 Jazz Festival in North America by JazzTimes Magazine and praised as one of the best concerts in NYC, this musical and cultural gathering in Downtown Manhattan features several artists and groups. It usually takes place during the first days of January and it’s characterized by a two-night marathon, creating a unique experience for music fans. It also hosts top panelists to discuss issues like sexism, immigration and protest in Jazz. This festival encourages the audience to try the diversity of the genre hopping into various shows during the night with one wristband that gives access to any gig. This important date for the Chinese between January and February is celebrated with a huge parade and a firecracker ceremony in New York’s Chinatown. During these two events, you will see a lot of street vendors, food booths, dragons, marching bands and lion dancers. The firecrackers start at noon on the first day of the Lunar New Year and the parade starts traditionally at 1 pm during the annual festival, a few days after New Year’s Day. Expect to have a great time sharing with your family and enjoying a show with acrobats, dancers, stilt walkers and performers. Finally, you can go to the Chelsea Piers to have some fun with the multiple drop-in activities offered for kids and adults. This place located on the Hudson River becomes an excellent choice to escape the bad weather, featuring a golf club with heated hitting stalls, bowling, ice-skating, batting cages and rock climbing. DestinationMundo.com specialises in destination guides by local experts – Videos & Virtual Tours of the best Restaurants, Nightlife, Things To Do, What’s On and more…..Subscribe to our newsletter to receive our latest travel articles straight to your inbox. Want to share your tips and advice? Got questions? Comment below to ask questions, get answers, meet people, and share your tips! Pingback: Welcome to Destination Mundo - Travel Destinations.